I'd never known such a device (above) existed until a joehead sent me the link, which he'd incidentally found while looking at the Instant Egg Peeler from Thursday. I had a look and darned if I can't use one of these greasecatchers too. 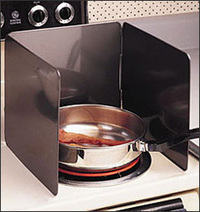 "Splatter Shield catches hot oil and grease before it permanently ruins your walls, tile or woodwork." Made of hinged aluminum; sets up in a second; wipes clean. "Triple-sided coverage while cooking home-fried chicken, bacon or searing pork chops and tender juicy steaks!" Was $7.99, now reduced to $6.99 here. After the last mess I created pan–frying a steak that seems cheap even at twice the price. » Codeine 3. from Codeine. I'm trying to buy a SPLATTER SHIELD. the link post is no longer available! does anyone know where I can buy a SPLATTER SHIELD!!! help, I've searched everywhere! I went to the link provided and the shield in now $8.99. It still seems like a good buy though.